Place clean potatoes into a pot, cover with water, salt and bring to the boil. Simmer for 10 minutes or until a skewer easily enters the potato. In a large bowl combine extra virgin olive oil, lemon rind, mustard, garlic, dill, salt and pepper. When the potatoes are cool enough to handle, slice them into 4cm thick rounds straight into the bowl and toss to coat. Place the potatoes on a large platter at one end. Put the pickles and creme fraiche in small bowls on the platter. 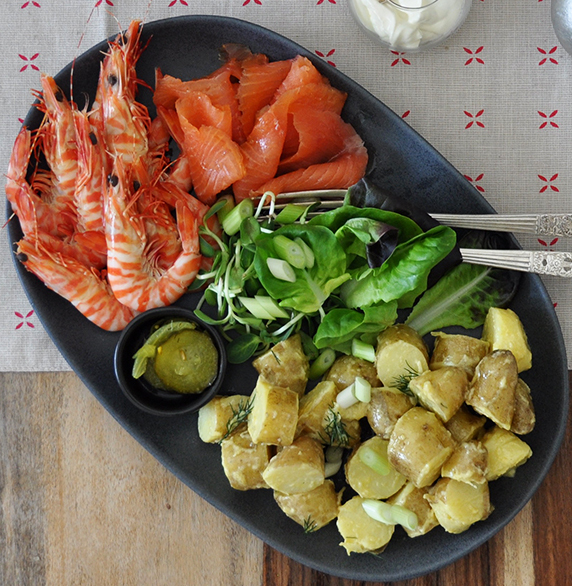 Arrange the prawns and salmon on the rest of the platter. Scatter dish with spring onion. Serve on a generous grazing board.